Assyrtico Suite, named after the famous wine variety, lies on the upper floor of the Serenity Villa. Its big balcony with superb view, the tastefully decorated bedroom and the spacious bathroom all guarantee an unforgettable stay. Watch the sunset, gaze at the stars, read a book in one of the comfortable armchairs, sunbathe on your sunlounger after you have plunged in the pool and reflect on the emotions unique Santorini offers you. Assyrtico Suite can sleep up to 3 people in a king size double bed and a single sofa bed. A fully equipped kitchenette is at your disposal as well as a big bathroom with a whirlpool bathtub. Our residence consists of two elegant guest houses right between the capital of the island, fira, and the picturesque village of firostefani. The property's houses can be rented either separately or together. The property is only 100 meters from the famous cable car, and opposite to the catholic chapel of St. Stylianos, one of the most photographed places on the island. Traditionally decorated apartments, ageing all the way back to the 18th century, have been fully refurbished in the winter of 2013 and transformed into cosy suites. The property is right in the heart of santorini and in a walking distance with all the restaurants, museums and of course the famous market of fira. Both our spacious suites have an open plan bedroom with a king size bed and a cosy living room with a comfortable sofa bed. A fully equipped kitchenette is also at your disposal. Both suites have a modern,very spacious bathroom with a jacuzzi bathtub and their own private balcony with uninterrupted views of the volcano and the Aegean sea. An exterior plunge pool is also available for all the guests of serenity suites & villa. For those who seek a unique experience with family, friends or their other half, serenity suites is the best choice. If you want to enjoy the tranquillity and breathtaking views offered by the caldera, without leaving the centre and the market of fira you're in the right spot. Please leave your laundry in the bags provided (separated, if needed) and our housekeeper will run the washing machine, when there is a full load of clothes in each one. Drying rack available. Big terrace with sitting area and sunloungers. Uninterrupted caldera view. Price includes every day cleaning service (except Sunday). 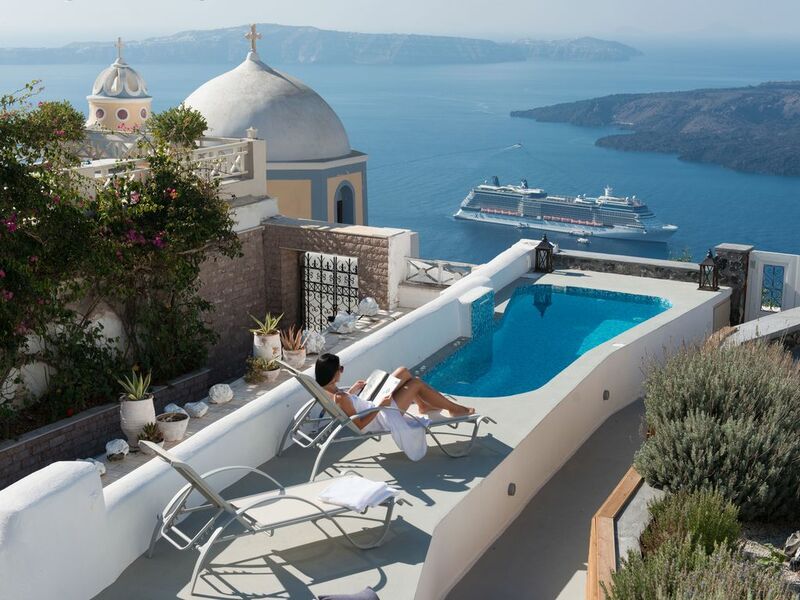 Spend a day exploring the island, visiting the Archaeological sites of Thira, making a wine tour or enjoy a relaxing cruise in the famous caldera of Santorini. Be prepared for lots of uneven steps and terrain that is the nature of Santorini. This is a place where less luggage, good walking shoes with covered toes, able climbing legs, is best. Stamos was on hand help carry luggage when you arrive and depart. We stayed at the top unit because of the large veranda and views. In the room, there are steps (with no railing) to go down to the bathroom. We found this quite hazardous. We got to see the bottom unit while the housekeeper was there. It was smaller and most like a hotel room. We did notice that it was newly renovated and didn't look as tired as the top unit which bathroom could use a make over. We were disappointed that the spa was not heated well and thus we were not able to enjoy it beyond a few minutes as we became very cold. Thira is filled with tourists and this unit is along a wonderful walking path for all admiring the view. The unit, however, maintains its privacy as it sits above the walk so you only see mostly heads of passers by. We went in early November. Many shops, restaurants, and businesses were already closed. However, we still managed to take in the awesome beauty of Santorini. Thank you very much for your feedback! Both we and our staff do our best to ensure a nice stay in our property. However, it is true that there is always room for improvement and we have already installed railings on the steps leading to the cave style bathroom, as soon as the last guest left and we have closed down for winter. Although Santorini can be wonderful all year round, chillier than expected November makes being outside and swimming in our heated (but not a hot tub, as we always inform our guests) plunge pool sometimes more difficult. The property was just as advertised. All necessary amenities on hand. Excellent location. 5 minutes away from the main centre of Fira, Close enough to all the bars and restaurants but far enough away to be peaceful at night. During the day the balcony areas become excellent suntraps, ideal for a relaxing afternoon. The owners were excellent from our first enquiry to the minute we left. Answering all our enquiries swiftly and assisting with booking transfers and day activities. The island central bus station is located in the centre of Fira and buses to all locations leave and return to and from here. Although the station is a bit chaotic the buses are very cheap and worth utilising. Thank you for your nice words. We always do our best to answer promptly all enquiries either about the villa or the island. We are happy you had a relaxing holiday! I don’t think I’ve ever stayed at a place with a view that was this gorgeous before. In addition to the view, it’s also a great location and an easy walk to Fira. The host was able to set up most of our transportation and Stamos helped us to get settled in. Overall, a wonderful trip! Amazing guests to an amazing place, what a happy coincidence! The location was perfect. The hosts were wonderful. If we were to do it again, we would go for the lower villa. The bathroom stairs were like an accident waiting to happen, so had to be extremely careful especially in the middle of the night. Also the shower was a little inconvenient , but we managed. All in all it was fine. we are glad you had a nice time in our property and consider coming back again. We will be delighted to welcome you in the future. We had the most amazing time at the Serenity Suites. The setting is spectacular and the property is ideally located with an incredible view of the caldera. Maria was very helpful and welcomed us with wine. The room includes all the amenities you can ask for. I highly recommend this property and will definitely be back. We are very happy we made your stay a memorable experience. We are looking forward to welcoming you again! It’s hard to describe how beautiful the property is.. and the view.. in a word.. “Wow”!! Serenity suites overlooks the Volacano and is very centrally located. You can walk to town and to many amazing restaurants. Even when you decide not to venture out, you’ll absolutely love just relaxing in the sun (or shade and taking a dip in the pool.) Everything was clean and comfortable and the hosts do everything in their power to accommodate any and all requests. I can’t say enough positive things about this listing. You may want to stay forever.. I’d recommend this place 💯�percent!! this is why we love this job: getting to know wonderful people like you! Thank you very much for your positive feedback. We wish you all the best! Fira (also known as Thera or Thira) is the main town of Santorini island,located on one of the highest points of the island with magnificent views to the infamous caldera. Fira is the ideal base to use for your vacation being in the very centre of the island. Staying in the centre you can combine the most stunning views of the island with a variety of things to do, places to dine and the most famous night-life.